If the Rayglass Legend 2500 is the Rolls Royce of trailer boats, the Legend 2500HT with the 300hp Mercury Verado must surely be a Bentley. Without diminishing the style and elegance of the Rayglass brand, the huge outboard on the stern shows this boat means business. Rayglass claims the Legend 2500 is 'the best boat ever built', and that’s certainly borne out in the quality of this model. Every aspect of this boat shows excellence, from the initial design through to the quality of the finish. This latest iteration of the Legend 2500HT has been mated with Mercury's Verado 300 to give that "sufficient plus 50 per cent" performance that made Bentley famous. Never a slouch, this 7.7m family boat now has extra performance for those occasions when you really do need to be somewhere in a hurry. One reason that Rayglass boats are so highly-regarded is the company’s commitment to listening to customers for continual design improvements. So the boat we tested is subtly different in numerous ways from the first Legend 2500 HT launched back in May 2006. 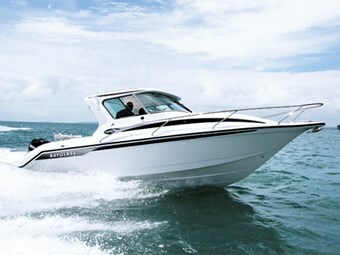 Starting with the hull itself, the 2500 is a redesign of the previous, popular Legend 730. The new hull incorporates a finer entry and fuller transom than the previous model, while retaining the full-length chines to give an efficient and comfortable ride. Our test day provided really choppy conditions – a 25-knot easterly wind, opposing tide. The Verado just hummed along quietly, and the electronic controls and power steering made it a breeze to drive. The power steering is one of the quietest and smoothest on the market today. Although Rayglass focuses on safe, solid family boats rather than outright performance machines, this one's no slouch. It rises out the hole effortlessly and easily reaches in excess of 45 knots. According to the supplied fuel consumption figures, the most economical speed range is around 4000rpm at 29 knots, where it consumes 35 litres of fuel per hour (around 1.2 litres per nautical mile). The 300-litre underfloor fuel tank therefore gives a range of around 250 nautical miles. We threw the boat around a fair bit, playing with the trim tabs into various combinations of wind and swell, and the handling is impressive. This boat will handle almost any conditions – the wiper on the big windscreen is almost redundant as we took very little spray over the bow, despite the conditions. A closer examination of the interior reveals further evidence of the boat's refinements. It's built with an outer shell and an inner moulded lining, with foam in between that provides buoyancy and significant sound muting. The stern area has a sub-moulding that caters for three different engine options: Sterndrive, single outboard or twin outboard. These three configurations are achieved by dropping a different sub-moulding into the transom area. Despite the Verado's bulk, it did not encroach into the boat at all. A sizeable boarding area is available either side of the engine, and the optional three-step stainless boarding ladder is fitted on the port side. While there is no step-thru transom as such, the port corner is slightly lower for easier access. Mounted into the transom on the starboard side is a good-sized livebait tank with a re-circulating pump. On the port side under a hatch in the lowered section is a freshwater washdown basin with a hand shower attachment. A 70-litre freshwater tank serves this and the galley sink. A ski pole is fitted in the centre of the transom. The test boat was fitted with Rayglass' custom baitboard which drops over the ski pole. This provides four additional rod holders, a plastic cutting board and handy recesses for holding knives and tackle. Under the ski pole mounting is a hatch with the two batteries and master switches. These have been lifted high off the floor, ensuring they stay dry. On either side are two additional hatches, which open to surprisingly deep wet lockers. The cockpit's almost too flash for fishing, but it’s perfectly set up for it. One change Rayglass has introduced in response to customer feedback is that the entire cockpit is self-draining. A bilge pump still takes care of anything that gets into the bilge, but this configuration means very little water will find its way below decks. The fitted carpets in the front part of the cockpit and the cabin are removable, allowing clean-ups with a pressure hose. Thigh pads on each gunwale provide comfortable support while standing, and there is good toe-room under the gunwale. These are also fitted with wide wood flat panels and are comfortable to sit on. Rod racks are fitted under the gunwales, as are LED lights for after-dark activities. Under a hatch in the deck is another Rayglass innovation: drop-in wet bins. On the outboard versions there are two 250-litre rotary moulded fish bins with handles – the stern drive model has just one. These are a perfect repository for big fish, fishing or diving gear, and can be removed from the boat complete with gear for cleaning. Moving forward under the hard top the boat has seating for four people. The skipper and observer are on elevated swivel seats that rotate 360 degrees, while two additional rear-racing padded seats contain additional storage. Foot rests for the skipper and observer ensure they are comfortable in the elevated position that also gives excellent visibility through the large, curved glass windscreen. The helm position is, in a word, excellent. The electronic control for the Verado is to hand on the right, and this sets a new standard for throttle control. Light and sensitive, it responds to the most delicate touch. The power steering is in the same league, providing effortless control with just the right amount of feedback. 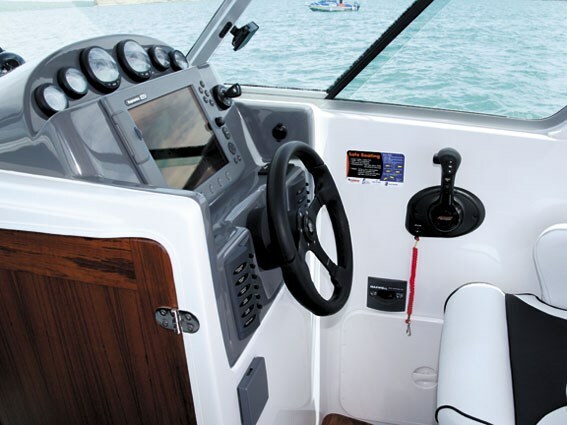 A top-of-the-range 12" Raymarine C120 multifunction display dominates the helm position. Radar and marine weather are options for this integrated electronics package. The Mercury instruments provide a continual update on the Verado’s performance. Radios are mounted above eye level in a moulded ceiling fitting, with a Sirius stereo CD player and an Icom VHF radio both fitted. Speakers are discretely mounted around the cockpit and cabin. Entry into the forward cabin is through an oversize hatchway with plenty of headroom. On the starboard side, in its own cubicle, is the toilet with electric macerator. The door serves double duty – acting as a lockable door to the entire cabin if required. 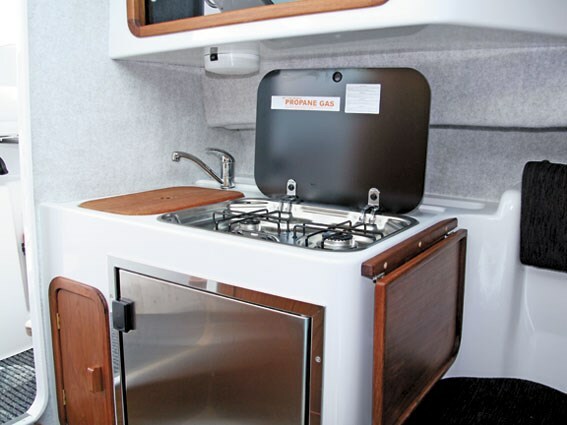 On the port side opposite the toilet cubicle is the galley, with a Smev range cooker. This features piezo-electric lighting, another design feature incorporated from customer feedback. A washbasin with hot and cold water takes care of the dishes, while a fridge under the unit keeps the food fresh. The generously-padded bunks are supplemented by infill squabs to create a big double bed. A large cover under the forward squab does double duty to cover the cabin doorway if a lockable cabin is required. Parcel shelves either side of the cabin are spacious enough to hold lifejackets or similar bulky items, and sealed lockers under each squab provide additional dry storage lockers. On the foredeck the capstan is hidden under a hinged cover, and the stainless Manson anchor is more than up to the task of holding the boat. It would not be necessary to venture onto the bow under normal operations, but if this is required a flat walkway extends all around the bow area, finished in a non-slip tread. The luxury finishes don't come lightly – the complete package weighs around 2780kgs. It sits on a Hosking’s tandem electric braked multi roller trailer and with a beam of 2.45 meters, the boat is well within all towing regulations. 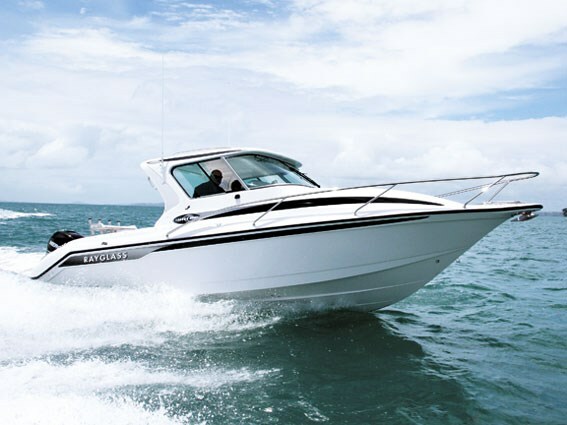 The 2500 HT is an impressive boat – it would be as appropriate for entertaining the chairman of the board as it is for a mates' day out fishing. It’s not the cheapest boat around, but with the quality of construction and finish – and level of specifications – it’s unlikely that you'd be disappointed.